It’s been a while since I have done anything about this film that has classic 80s computer game characters in in. From Pac-Man to Donkey Kong, they are all here. This time we have been sent over new, UK specific, artwork. This one shows one of the greatest 80s game character eating Canary Walf as he goes through the world. As kids in the 1980s, Sam Brenner, Will Cooper, Ludlow Lamonsoff, and Eddie “The Fire Blaster” Plant saved the world thousands of times – at 25 cents a game in the video arcades. Now, they’re going to have to do it for real. 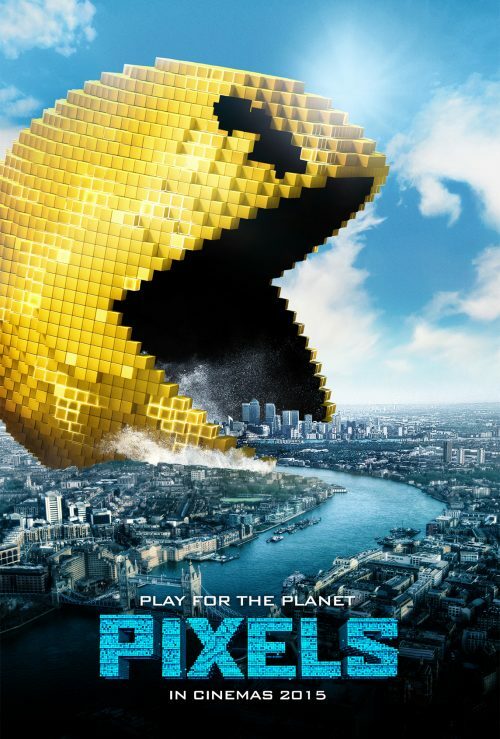 In Pixels, when intergalactic aliens discover video feeds of classic arcade games and misinterpret them as a declaration of war, they attack the Earth, using the video games as the models for their assaults — and now-U.S. President Cooper must call on his old-school arcade friends to save the world from being destroyed by PAC-MAN, Donkey Kong, Galaga, Centipede, and Space Invaders. Joining them is Lt. Col. Violet Van Patten, a specialist supplying the arcaders with unique weapons to fight the aliens.